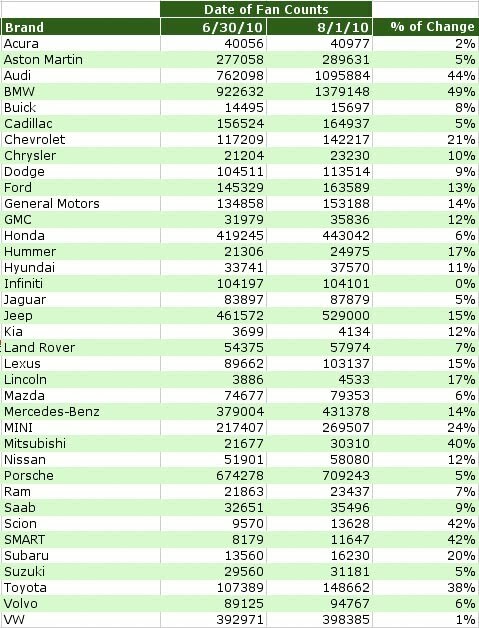 Some of the smaller volume brands like Mitsubishi, Smart and Scion also experienced over 40% growth leading me to believe both also ran Facebook advertising this past month. 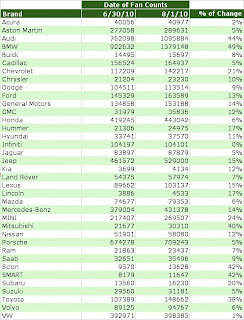 Toyota gained an impressive 38% fans in July. They were actively promoting their latest social media user generated content idea called “Auto-Biography” where the social media team selected a few stories to be “animated with the help of [their] artistic friends”… i.e. ad agency. 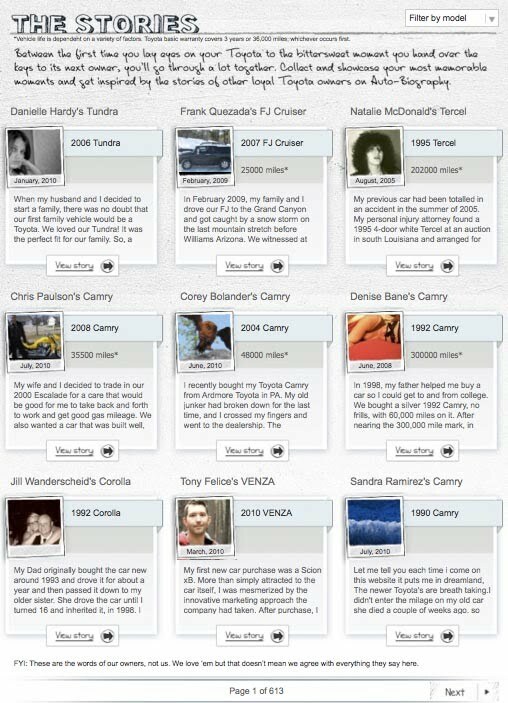 This is interesting, as Toyota has been running several safety videos in response to their much publicized recalls. Here we finally see Toyota recovering from the bad public relations and turning to the voice of the customer, which I think is a good move based on where the brand is today. Let the consumer voice showcase their passion for the products. It was a risky bet, except that Toyota approves every story before it is posted on the Facebook tab. The only odd thing in July was a negative fan dip for the Infiniti brand. It would be interesting to see why this is happening. My guess is that some Infiniti fans are a bit turned off by the social media team’s wall posts promoting the Cirque du Soleil promotion; though, this guess is just that a guess. Looking at the fan page comments on the Cirque posts, several fans do enjoy the association. It still could be due to an increased frequency of the team pushing every marketing promotion on the page's wall. 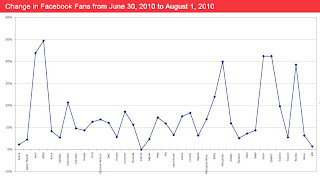 Without knowing the Facebook analytics and insight data, it is difficult for me to assess what is going on, perhaps their Facebook team should look at frequency of posts and also when the fan drop may have occurred since it is pretty rare to see a brand page lose fans in a month. 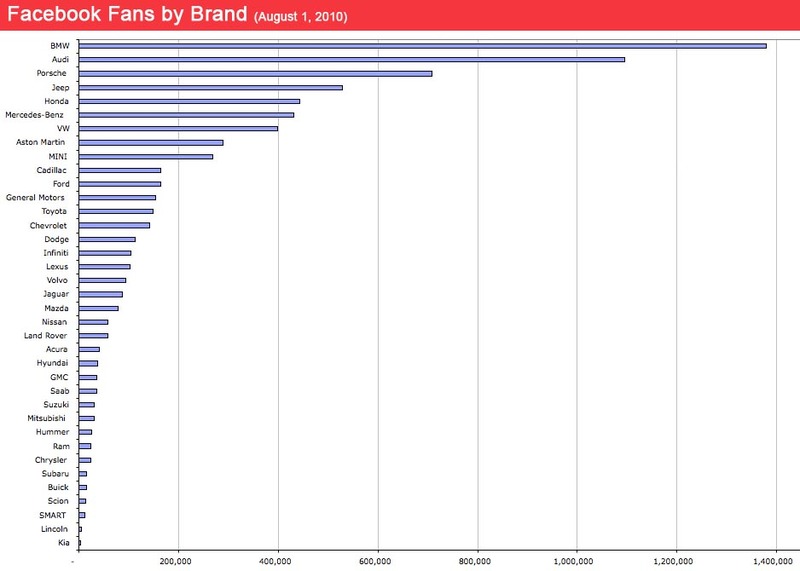 Those numbers are impressive, but how are these manufacturers monetizing their Facebook pages? Any sort of uptick in sales, or just a number to be proud of? 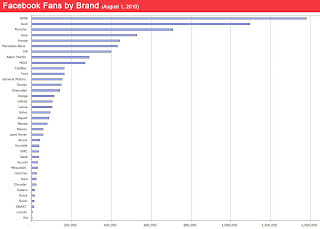 i performed a similar analysis, but weighted the fan reach against each brands market share to measure reach. 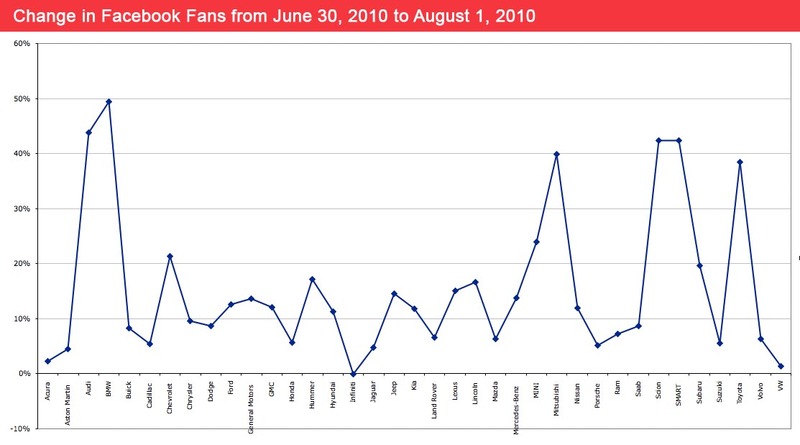 i then measured engagement by using fan submitted photos as a proxy for unaided engagement and # of fan comments on official photos as a measure of aided engagement. overall i saw a number of interesting learnings, most interstingly that the americans, generally speaking, kick the import brands a$$ when it comes to engagement.